The Juris Doctor (JD) programs at USF, which include full-time and part-time options, have several highly regarded areas of concentration. Our pioneering program in intellectual property and technology law, which includes a certificate option, a law clinic for hands-on training, and a research institute, is among the best in the country. Our innovative international law program includes courses, study abroad opportunities, and internships that circle the globe. For those pursuing business law, we offer a certificate, as well as a concurrent JD/MBA program. Our noted public interest law program is rooted in USF's Jesuit mission of educating minds and hearts to change the world. For individuals with a law degree, USF offers a Master of Laws (LLM) degree in two fields. The LLM in International Transactions and Comparative Law is offered exclusively to lawyers with law degrees from a non-U.S. college or university. The LLM in Intellectual Property and Technology Law is open to anyone with a law degree from an ABA-accredited law school or from an institution outside the United States. Enriching the global perspective of class discussions, foreign lawyers in both LLM programs are integrated into the JD program courses. The USF School of Law's numerous curricular opportunities are enriched by institutes, centers, and special programs, creating an intellectually vibrant community that integrates course offerings, student journals, and faculty research. Students are able to learn, gain practical experience, and participate in a range of activities that equip them with the practical skills and theoretical foundation needed for practicing law in the global community. 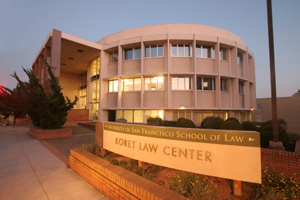 Want more info about University of San Francisco School of Law? Get free advice from education experts and Noodle community members.